Thanks to the people who added comments and inspired this post. The idea of stretching people borders on arrogance. Discomfort gives meaning to challenge. What gives you the right to challenge people to the point of discomfort? What makes you think you know what’s best for others? People aren’t objects. Are you a sadist? Arrogance demands more from others than it demands of itself. Conceit looks down its nose. If you’re going to lead, demand more from yourself than you expect from others. Leaders need to grow more than anyone else. How are you stretching yourself? How are you stepping into personal disruption and discomfort? The ability to say, “No,” makes challenging people healthy. If people can’t say, “No,” it’s a demand, not a request. Sometimes leaders give direction. Understand the difference between, “I need you to.” and “Would you?”. Build trusting relationships that include permission to reject the challenge. Understand people’s strengths and weaknesses. Establish alignment between the advancement of individuals and organizational goals. Become aware of an individual’s personal goals. Use curiosity to stretch people you don’t know. How might you stretch yourself in this project? What does it look like to take yourself to the next level? How comfortable are you with your plan? How might you challenge yourself? Stay available, but don’t be too helpful when people stretch themselves. What are the downsides of stretching people? What is essential when challenging people to step into discomfort? I would never ask someone to go beyond the bounds of what they are comfortable of. But I would remind them that what they think they are capable of is usually short of what they are capable of. But only getting uncomfortable will allow them to see what is possible in the latter. Thanks Alf. Welcome back from vacation. I hope you had a great time with your family. Your approach makes sense. It feels kind/gentle to say they are living below their capability. “I believe you are capable of more,” is a powerful statement. I love looking someone in the eye and saying, “I believe you have more in you.” These words are often tipping points for growth. Your approach also answers the problem of arrogance by showing faith in people. Frankly, there’s no point in challenging anyone if we don’t believe in them. We should never challenge anyone if we don’t believe in them. We’ll have to discuss the place of discomfort in growth. It wouldn’t surprise me that your choices about education have made you uncomfortable. Great seeing you here tonight. Dan, this stopped me in my tracks: “Leaders need to grow more than anyone else.” You have a way with words–that’s an understatement. And then there’s this: What makes you think you know what’s best for others? By the way, I am reading (for the third time) a book written in 1938 by Brenda Euland: If You Want to Write: A Book about Art, Independence and Spirit. It’s far more than a book on writing and great for everyone, but especially for coaches and leaders. Thanks Alan. I think if more of us understood the challenge of growing our own leadership we might be a little more humble. 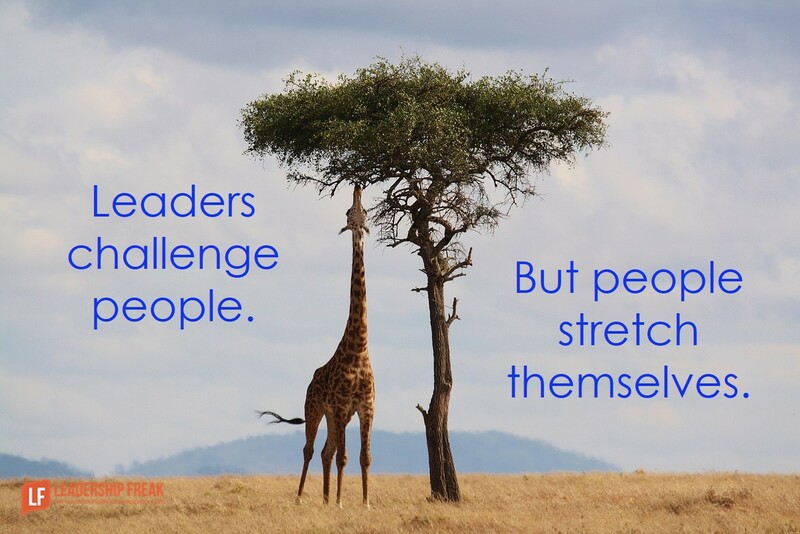 Stretching people is a must for leaders – if the person wants to be stretched. Great leaders identify those who have potential and do everything in their power to bring out the best in them. Great leaders also identify those with ambition and the desire to grow and excel. This is not arrogance, this is level 5 leadership where leaders help their people realize their potential and beyond without an ounce of ego involved. Consider a high performance coach be it in business, sport or any other field. The coaches role is to stretch the person beyond what they believe they are capable of. That’s why they have a coach, to become the best they can be. Being stretched out of your comfort zone is how you grow. It’s how businesses grow. That’s not arrogance, that’s being smart. Some people don’t want to grow. That’s fine if their role is purely functional and nothing more is expected of them. A smart leader hires those who want to be coached, who want to be stretched who want to challenge the norm. That’s what makes them a great leader. Ultimately innovation and not imitation is what makes a business sustainable. Isn’t that what disruption is? Thanks Dan for challenging the norm. Thanks Strategez. You’re point about desire to grow is important. They say you can’t coach desire. There are also people in organizations who might not express aspiration, but when challenged they rise up. But, it’s important not to impose our aspirations for people on those who have none for themselves. “Real relationships include the right to say, “No.”” – this highlights that to have meaningful relationship, everything needs to be two way, give and take on both sides. Sometimes commenting only to a person, “I think you have more in you” or asking “do you want to give this a try?” is enough to encourage a person to stretch, in their own time and in their own way, reducing some of the pressure someone being stretched may feel under. Thanks Thinker. Alf’s comment reminded me that it’s important to have a foundation of belief. I remember asking a leader, “What if you’re selling yourself short?” It was an open door for his imagination. In the end, it took him to an important volunteer role as a leader that continues to enrich his life. “What are the downsides of stretching people?” – stretching too far at once or stretching too far too soon. The time and stretch require to be right. What happens to an elastic (rubber) band when you overstretch it? What is essential when challenging people to step into discomfort? – never ask someone to do something you wouldn’t do yourself. So to get her to even consider setting out of her confort zone, I had to start by working on her self-talk. Thanks Paul. Wonderful addition. Confidence is a big part of taking on new challenges. People with confidence talk themselves into things. People without confidence talk themselves out of things. I suppose students have declared what’s best for themselves when they sign up for the class. Many UK companies aren’t interested in growing/stretching people, it would seem. The model is very much buy in off the shelf and use it as is. The mindset doesn’t seem to consider either the need for, or the advantages of, growth. It’s like buying a screwdriver – you expect it to work out of the packet without having to develop it. Where it falls down is that you buy a screwdriver, but then you get annoyed when it doesn’t work well as a pair of pliers! I am in love with your posts! I need this stuff. I am so blinded by my own arrogance that I willfully stretch ppl and end up being disappointed for them not living up to my expectations! So your articles are real eye openers. And I will continue to work on me more than others.